Most of us have at least one bad habit when it comes to food. Today, I admit mine. I am a seasonal-food-buying addict. I blame it on the media. Which really means I blame myself. My “problem” began one mid-September morning while working on a newscast for the CBS affiliate in Dayton, Ohio. I was probably writing a story about the recent windstorm—”the remnants of Hurricane Ike” was its official moniker—that knocked out power to hundreds of thousands. Or perhaps I was taking a call from a distraught viewer—refrigerator contents spoiled, food stamp money gone, calls to the local power company unanswered—who wondered if we could please help her find food for her babies? (Equally likely: a call from a viewer who simply wanted to know what day it was. Newsrooms deal with the strangest people.) Regardless, my world came to a screeching halt when the following words crossed the wire. Apparently some critical pumpkin-growing parts of the country had experienced record rain over the summer. Many growers barely got their gourds in the ground; others were harvesting early in fear of fungus. The result? A [possible] nationwide shortage. The nation didn’t wind up in a pumpkin shortage, but my neighbors likely had trouble finding the stuff. By November, I had amassed dozens of cans—as if I were preparing for some harvest-themed Y2K. My roommate and I tried to bake our way through them (pumpkin cranberry muffins! pumpkin pie dip! pies! pancakes! cheesecakes!) but even by January we had barely made a dent in my stash. I brought a whole box to Jason’s when we got married; a half dozen accompanied us on the move from Ohio to Texas. I’m ashamed (or proud?) to admit that I used the final fifteen ounces the week before we moved to Nashville. FIVE YEARS LATER. You would think I learned my lesson. But last week (while picking up snacks for our road trip) I happened across a fantastic sale on cherries. How good, you ask? They were actually cheaper than grapes. That familiar, frenetic voice inside my head urged more! more! MORE! as I loaded my cart with pound after pound. I emerged with six giant bags of the berries and the creeping realization that, due to our four-day vacation, I would have to pit and freeze them all tonight. I crawled into bed three hours later, cuticles stained a shade of red-brown that suggested a barehanded homicide. (Note to self: buy a cherry pitter.) However, with two gallons of cherries in the freezer, I may be able to avoid that task until at least 2019. *I used Alessi Premium Balsamic Reduction (I found mine at Kroger for $6 or so), which takes the work out of reducing the vinegar yourself. If you can’t find something similar, buy regular balsamic vinegar and boil it until it reaches the consistency of a thin chocolate sauce. It will cause your whole house to smell like vinegar, so if you can do this ahead of time—in other words, not right before a meal—your nostrils will thank you. While pork is resting, add cherries, sugar, and 1-2 tablespoons water to any pork drippings in the pan. Bring to a low boil and cook 1-2 minutes (longer if cherries are frozen), until it gets nice and saucy. Turn off heat and stir in balsamic reduction. Spoon sauce over pork chops and serve. *Gorgonzola a good “gateway blue,” since it’s sweeter and milder than other blue cheese varieties. However, feel free to substitute with something stronger. 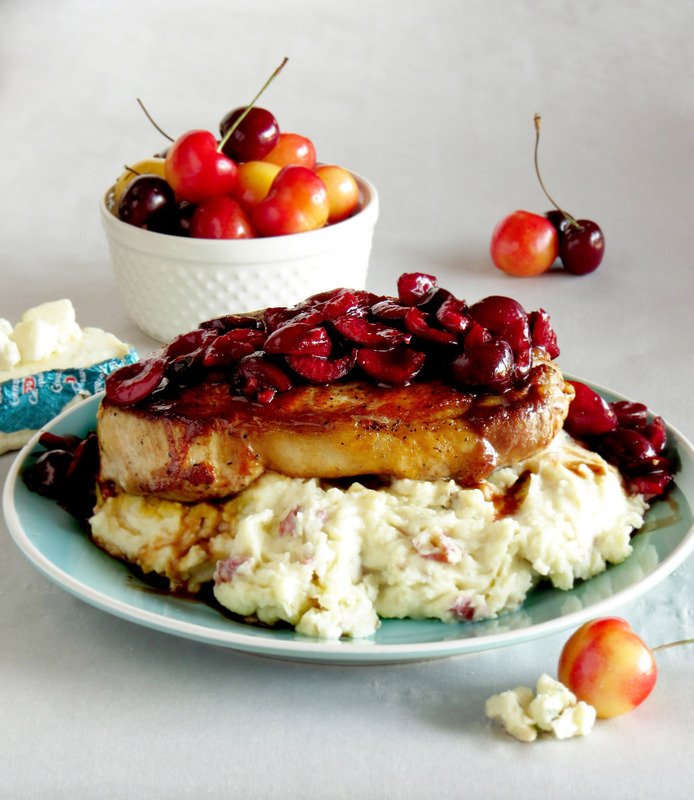 If you HATE blue cheese, just omit it; a substitution like Parmesan won’t pair as nicely with the cherries. Place chopped potatoes and 1 teaspoon salt in large pot. Cover with tap water. Bring potatoes to a boil, then reduce the heat slightly. (You’re looking for something between an aggressive simmer and a leisurely boil. The potatoes are obviously moving around, but you’re not worried about your water boiling over.) Once you reduce the heat, set a timer for 10 minutes. You’ll start checking the potatoes when it beeps. In the meantime, put the milk and butter in a large mixing bowl; microwave in 10-second intervals until butter is melted and milk is warm. Set aside. Once your timer beeps, use a fork to start poking your potatoes. When it effortlessly pierces the thickest part of several potatoes, move on to the next step. Pour potatoes into a large colander to drain. Once most of the water is gone, slide the spuds into the mixing bowl with the milk and melted butter. Add sour cream and Gorgonzola. For chunky potatoes, mash with a potato masher or fork. For a smoother texture, use a mixer until you reach your desired consistency. Season with a good dose of salt and a little bit of pepper. 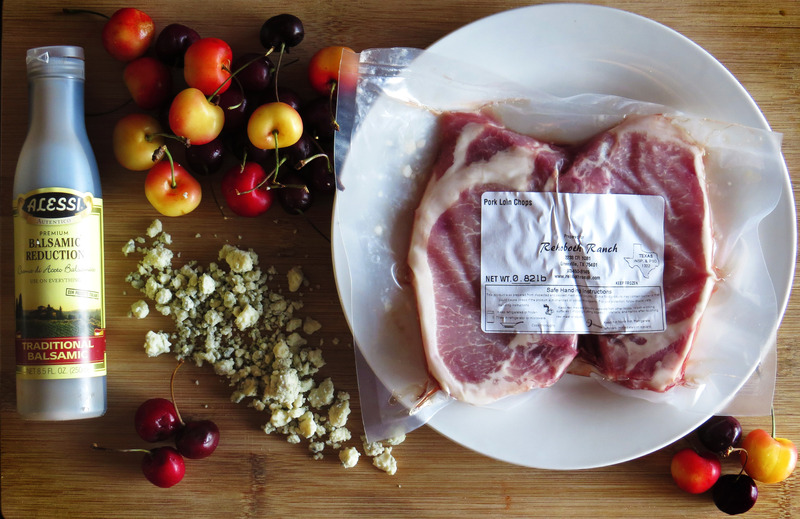 I actually found myself trying to make dinner out of cherries and pork tonight. (Yours looks tastier.) And I don’t have cherry pitter either, so I ending looking like I’d walked off the set of Dexter. This was delicious! I accidentally put too much water in, but it was still good.